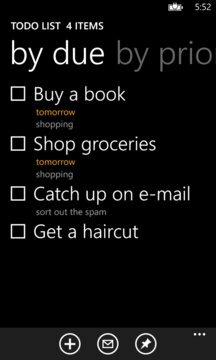 Lists & Things is a flexible, yet easy to use list management app and reminder app. It supports both todo and shopping style lists, in one easy to use interface. Backup to Dropbox and SkyDrive supported. 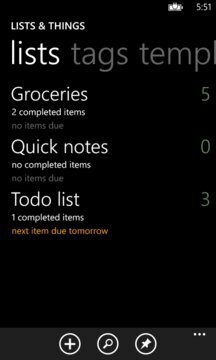 Lists can be pinned to start as live tiles, and display a range of different details about the list. The main app tile can be made live as well. Also, reminders will now alert you with a message and alarm sound when a task is due. Todo style lists lets you easily create and complete tasks. You can sort by name, priority and due date. Tasks can have detailed descriptions, tags and even images. Tasks near their due date are color coded to be easy to spot. Shopping style lists lets you store frequently used lists for re-use. Highlight the items you need to shop, filter out the rest and complete items as you go shopping. Then just reset the list and it's ready to be re-used.